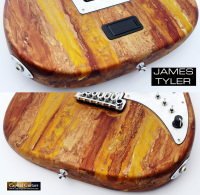 Offered is this spectacular and seemingly unplayed 2010 Tyler Studio Elite in Caramel Cappuccino Shmear finish. 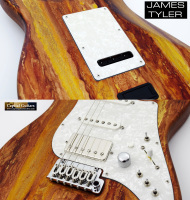 The term "Super Strat" is often used, but it certainly applies to this extraordinary guitar. 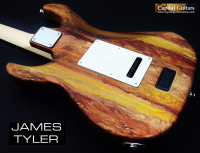 Specs for this incredible instrument include: a solid Alder body, with a total guitar weight of just 7 pounds, 14 ounces; a quartersawn maple '59 shaped neck with depth measurements of .845" at the 1st fret and .975" at the 12th; an Indian rosewood fingerboard with 9.5"-12" compound radius, medium/jumbo frets and 1 5/8" nut; a G2H trem bridge with drop-in arm; and locking Hipshot tuners. The electronics on this guitar require a bit of discussion. 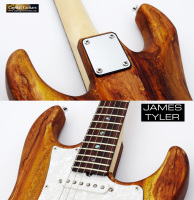 The pickups include two Tyler "Classic Stacks" in the neck and middle positions and a Tyler "Chrome Shark" humbucker in the bridge position. 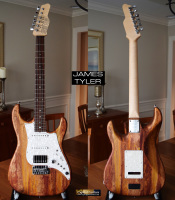 The Classic Stacks are humbuckers disguised as single coils, so while this guitar appears to have an SSH pickup layout, it effectively has an HHH layout. 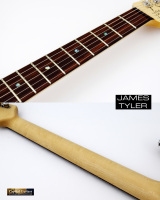 Add to this the following controls: 1) master volume; 2) 5-way pickup selector (neck, neck+middle, middle, middle+bridge, bridge); 3) three individual mini-toggle switches which allow separate control of each pickup, as follows: series humbucker/pure single coil/ parallel humbucker; 4) a black button which controls the level of the guitar's active mid-boost circuit; 5) a white push button which activates the mid-boost; 6) an individual mini-toggle which controls the guitar's "lead/rythm" circuit which when activated, effectively kills all other electronics leaving only the bridge humbucker, master volume and the mid-boost active. With these electronics and controls, the player has an almost endless number of tone options at his or her control. You can produce almost any guitar tone that you can imagine and the mid-boost circuit is like having a built-in overdrive pedal that can give you everything from a warm crunchy rythm sound to an explosive 'LP through Marshall' like lead drive tone. This beauty plays effortlessly and sounds fantastic. The attached sound sample gives you just a taste of the many sound options at your finger tips. The smooth, dry, almost finish-free neck feels fabulous in your hands and the neck shape is just about perfect. While built in 2010, this one-owner guitar has seen little to no play and remains in near mint condition. The only flaw worth mentioning is a tiny bit of oxidation on the pickguard from the five-way switch shaft. Otherwise this guitar is in mint condtion and the frets are flawless. 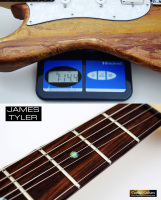 It comes in it's original Tyler/G&G case, along with the trem arm, spec sheet and tools. A new example of this model will cost you nearly $6K, but you can save yourself a ton with this near mint 2010 example. 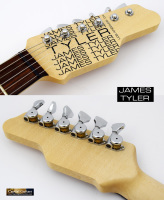 This is an exceptional Strat-style guitar, even as Tylers go. Make this incredible instrument yours today!